Born: 24 November 1824, Dawlish, Devon, England. Died: 23 February 1912, Grahamstown, South Africa. 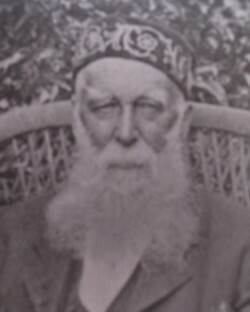 William Tuck, horticulturalist, emigrated to Natal in 1849, where the ship on which he was travelling was wrecked off the Bluff at Port Natal (now Durban). At first he lodged with the German naturalist Dr W. Gueinzius* and worked as a gardener in the village. In 1854 he moved to Uitenhage, where he worked in the well-known garden of Joachim Brehm*. According to a letter that Tuck wrote to the Agricultural Journal of the Cape of Good Hope in 1892 (Webber, 1925, p. 15), Brehm had first imported the Bahia Naval Orange from Brazil in 1850 and in 1854 trees grafted by Tuck were distributed to various parts of the colony. By 1859 Tuck had moved to Somerset East, where he worked for the municipality. He became curator of the botanic garden at Grahamstown in 1864. Two years later he sent plant material to Kew Gardens in England. By May 1867 he had given up his position and returned to Somerset East. The management committee thanked him for his successful and faithful management of the garden and awarded him the sum of ten guineas. He returned to Grahamstown as curator of the botanic gardens during 1868-1870 and then went to the diamond fields at Kimberley, where he appears to have been moderately successful in the diggings. During 1873 Tuck sent herbarium specimens to Kew Gardens and soon afterwards returned to Somerset East. There he and P. MacOwan* collected the fungi of the district during 1875. They found 250 species, of which many were new to science. Among others Tuck found a remarkable phalloid fungus described as a new genus and species, Kalchbrennera tuckii. However, it had already been recorded from northern Angola and given a different name, which had priority. In December 1878 Tuck succeeded J.H. McLea* as curator of the Graaff-Reinet botanic gardens. He remained there to 1880. In 1882 he travelled to Australia, Tasmania and England and upon his return in 1884 settled in Grahamstown. There he was in charge of the propagation section of Messrs Gowie's nursery. He continued to collect and cultivate indigenous plants, particularly orchids, during the eighteen-nineties and sent many plants to firms in England and Germany. He also sent specimens to MacOwan, which are now in the Compton Herbarium, Cape Town. In 1897 he served on the committee of the Grahamstown and Albany Horticultural Society. He presented insects to the Albany Museum in 1895, followed by some lepidoptera (butterflies and moths) in 1901. The plant species Kniphofia tuckii (family Liliaceae) and Cyrtanthus tuckii (family Amaryllidaceae) were named after him. Cape of Good Hope. Report of the committee of the Albany Museum, 1895, 1901. Cape of Good Hope. Report on Gill College Museum, 1875. Cape of Good Hope. Report on the Graaff-Reinet botanic gardens, 1878-1880. Doidge, E.M. South African fungi and lichens to the end of 1945. Bothalia, 1950, Vol. 5, pp. 1-1094 (see p. 36). Grahamstown and Albany Horticultural Society. First show, 1897. (G.M. Bowker Museum, Grahamstown). Grahamstown Journal, 24 May 1867, p. 2, Botanic Garden. Henning, C.G. A cultural history of Graaff-Reinet (1786-1886). Doctoral thesis, University of Pretoria, 1971. McCracken, D.P. & McCracken, E.M. The way to Kirstenbosch. Cape Town: National Botanic Gardens (Annals of the Kirstenbosch Gardens, Vol. 18), 1988. Sch�nland, S. Grahamstown orchids. E.P. Magazine, 1892, Vol. 1(1), pp. 27-29. Webber, H.J. A comparative study of the citrus industry in South Africa. Department of Agriculture, Bulletin No. 6, 1925.